July 1980: he makes his first appearance on stage at the Kabukiza, playing the role of the child emperor Antoku in the classic "Yoshitsune Senbon Zakura". July 1983: he becomes Ichikawa Kamejirô II at the Kabukiza by playing the role of Kamuro Tayori in the dance "Modori Kago Iro ni Aikata". July 1998: Kamejirô becomes nadai and celebrates it by playing the role of Osato in the "Sushiya" scene of the play "Yoshitsune Senbon Zakura", which is staged at the Kabukiza. January 2000: Kamejirô plays for the first time the prestigious role of Princess Taema in the play "Narukami", which is staged in Ôsaka at the Shôchikuza. The role of Narukami is played by his father Ichikawa Danshirô IV. August 2001: Kamejirô takes part in a Kabuki show in Houston (Texas) at the Museum of Fine Arts. August 2002: first edition of the program of the association Kamejirô no Kai; Kamejirô plays in Kyôto at the Shunjûza the roles of Tamate Gozen and the spirit of the shishi in "Gappô Anshitsu" and "Kagami Jishi". 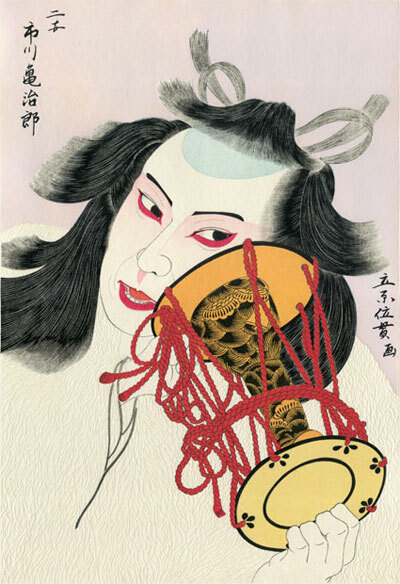 August 2003: 2nd edition of the program of the association Kamejirô no Kai; Kamejirô plays in Kyôto at the Shunjûza the roles of the Wisteria Maiden, the shôjô and the wandering woman Hanjo-no-Mae in "Fuji Musume", "Shôjô" and "Sumidagawa". August 2004: 3rd edition of the program of the association Kamejirô no Kai; Kamejirô plays in Kyôto at the Shunjûza the roles of Ichijô Ôkura Naganari and the Heron Maiden in "Ichijô Ôkura Monogatari" and "Sagi Musume". August 2005: 4th edition of the program of the association Kamejirô no Kai; Kamejirô plays in Tôkyô at the National Theatre the roles of Ofuna and Shizuka/Tomomori in "Yaguchi no Watashi" and "Funa Benkei". May ~ June 2006: Kabuki tour in Western Europe, in London at the Sadler's Wells (31 May~11 June) and in Amsterdam at the Stadsschouwburg (15~18 June); Kamejirô plays the role of Kasane in "Kasane" [more details]. August 2006: 5th edition of the program of the association Kamejirô no Kai; Kamejirô plays in Tôkyô at the National Theatre the roles of Sadatô/Sodehagi and the celestial creature in "Sodehagi Saimon" and "Ama-kudaru Keisei". January 2007: Kamejirô receives the Terayama Shûji Award of the 6th Asahi Performing Arts Awards (2006). March 2007: tour in Paris (France); Kamejirô plays at the Palais Garnier the roles of Yoshitsune and the Mountain God in the dance-dramas "Kanjinchô" and "Momijigari", which celebrate the Ichikawa clan [more details]. March 2009: Kabuki adaptation by the famous stage director Ninagawa Yukio of Shakespeare’s "Twelfth Night", which is entitled "Ninagawa Jûniya", from the 24th to the 28th of March 2009 in London (UK) at the Barbican Theater; Kamejirô plays the role of Maa (Maria) [more details]. The same play is staged with the same casting in June 2009 at the Shinbashi Enbujô and in July 2009 at the Shôchikuza. June 2012: Ichikawa Kamejirô II and his uncle Ichikawa Ennosuke III take the respective names of Ichikawa Ennosuke IV and Ichikawa En'ô II at the Shinbashi Enbujô, performing in a special program which celebrates the hatsubutai of both Ichikawa Chûsha IX and Ichikawa Danko V and commemorates the 49th anniversary (50th memorial service) of late Ichikawa En'ô I and Ichikawa Danshirô III; the new Ennosuke plays the roles of Tadanobu and Yamato Takeru in "Kawatsura Hôgen Yakata" and "Yamato Takeru" [more details]. July 2012: Ichikawa Ennosuke IV celebrates his second month of shûmei at the Shinbashi Enbujô, playing the roles of Yamato Takeru and the old woman Iwate (in reality the ogress) in "Yamato Takeru" and "Kurozuka" [more details]. January 2013: Ichikawa En'ô II, Ichikawa Ennosuke IV and Ichikawa Chûsha IX celebrate their shûmei in Ôsaka at the Shôchikuza; the new Ennosuke plays the role of Tadanobu/the fox Genkurô in both "Yoshinoyama" and "Kawatsura Hôgen Yakata" [more details]. March 2013: Ichikawa En'ô II, Ichikawa Ennosuke IV and Ichikawa Chûsha IX celebrate their shûmei in Nagoya at the Misonoza; the new Ennosuke plays the roles of the old woman Iwate (in reality the ogress) and Tadanobu/the fox Genkurô in "Kurozuka" and "Kawatsura Hôgen Yakata" [more details]. 19th March 2013: Ennosuke performes for the 100 times the role of Tadanobu/the fox Genkurô in "Kawatsura Hôgen Yakata", in Nagoya at the Misonoza. 27th March 2013: Ennosuke receives at the ANA Intercontinental Hotel in Tôkyô the Excellence Prize (yûshô shô) of the 34th Matsuo Artistic Awards (Matsuo Geinô Shô). April 2013: Ichikawa Ennosuke IV celebrates his shûmei at the Kanamaruza (Shikoku); the new Ennosuke plays the roles of Tadanobu/the fox Genkurô and Sodehagi/Abe no Sadatô in "Kawatsura Hôgen Yakata" and "Sodehagi Saimon" [more details]. June 2013: Ichikawa En'ô II, Ichikawa Ennosuke IV and Ichikawa Chûsha IX celebrate their shûmei in Fukuoka at the Hakataza; Ennosuke plays the role of Yamato Takeru and Tadanobu/the fox Genkurô in "Yamato Takeru" and "Kawatsura Hôgen Yakata" [more details]. July 2013: Ichikawa Ennosuke IV celebrates his shûmei in the eastern provinces [more details]. December 2013: Ichikawa En'ô II, Ichikawa Ennosuke IV and Ichikawa Chûsha IX celebrate their shûmei in Kyôto at the Minamiza; Ennosuke plays the role of Tadanobu/the fox Genkurô and the old woman Iwate (in reality the ogress) in "Kawatsura Hôgen Yakata" and "Kurozuka" [more details]. June 2014: Ichikawa Ennosuke IV and Ichikawa Chûsha IX celebrate their shûmei in the central provinces [more details]. September 2014: Ichikawa Ennosuke IV and Ichikawa Chûsha IX celebrate their shûmei in the western provinces [more details]. Ichikawa Ennosuke IV is a young, popular and talented actor. Check his official website (http://www.ennosuke.info/) for more details and great photographes.